Before Boskone, I visited my friends in Cambridge, who build transgenic blood cells and figure out the mysteries of cell signaling. Meanwhile, our Harvard friends construct termite robots. 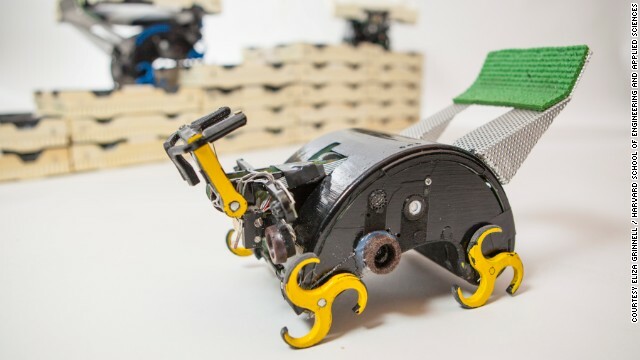 These adorable Lego-like robots supposedly scurry like termites stochastically building the termite equivalent of Highclere castle. Termite mounds are visible from space—though I wonder how great a claim that is now that satellites can read your book over your shoulder, but never mind. This evening’s Boskone panel is about the rising seas, which are destined to overcome Boston. The termite robots might be helpful to build levees or repair them in case of a breach. But I wonder if termites are the best model. What about those army ants that build “bivouacs” of their own bodies? The bivouac is made of the living ants linking their legs and bodies into a living mass that contains and protects the queen and larvae. It’s impressive—I believe this sort of behavior inspired the wall-climbing zombie masses of World War Z. While more sinister in appearance, perhaps, than the termite Lego-bots, I think the robots building themselves into the breach offer a more interesting approach to robot construction. More about such robots—and army ants—in my current Frontera novel. ← Mars Water Found by Undergraduate? You could probably program these critters to first do the requisite environmental, geological, archeological and historical survey data collection before you let them loose to move the dirt/city around. Sounds cool. But wouldn’t such useful critters be better used to bring inert material to a job, rather than locking themselves down as ‘bricks’ in the structure? Think of living cells. Living cells of a developing organism are “builders” that build the organism out of themselves as building material. This is what built the sequoia trees to last for thousands of years–still growing.